One fine day, a franchisor, a preferred vendor, and some franchisees decided to build a franchise system together. They found many good locations and built a number of great units. The franchisor asked the preferred vendor to divide up what they had accomplished together. So, the preferred vendor made up three roughly equal parts and let the franchisor chose. Angered by the vendor's lack of grace, the franchisor revoked the preferred vendor's status for cause- bankrupting the vendor and acquired all the vendor's confidential information. "None other than the preferred vendor and what happened to him, sir!" With the scraps, the franchisees rushed off, tails between their legs, to bitterly complain in some small, far off location where the franchisor could pretend not to hear them. This fable or wisdom story dates back to what Cialdini calls the First Era of Persuasion - which ended badly for the persuaders. 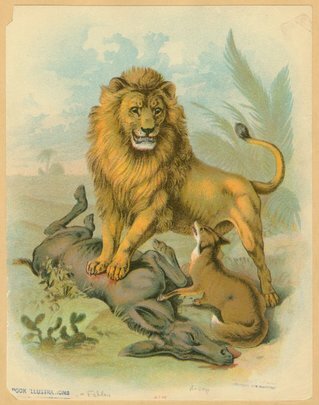 It is known as the fable of the Lion, the Donkey and the Fox. Moral: A partnership with the economically powerful is untrustworthy. If you want to partner with your franchisor, create an modern Independent Franchisee Association working for all of you. It pays to be a member, both as franchise owner and supplier. Are you a supplier that wants to get increased exposure to franchise owners? Do you have a product or service that solves a problem for some, even if not all, franchisees in a system? And would it help if Franchise-Info made franchise owners more acutely aware that they have this problem? Then, you need to market directly to franchise owners. Connect me directly on LinkedIn. Ask about "Preferred Vendor Marketing"